Posted on Thu, Mar 15, 2012 : 11:52 a.m. The Rutherford Pool will remain closed in 2012 but reopen in 2013. 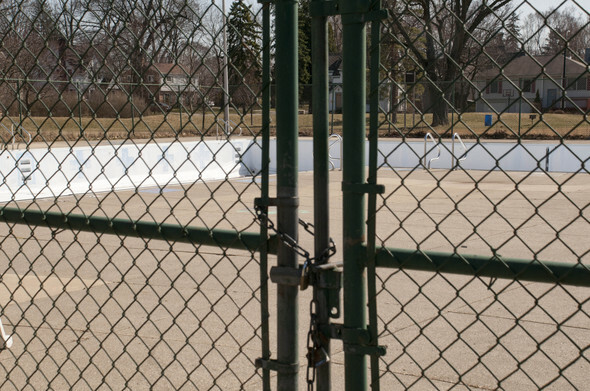 Ypsilanti's Rutherford Pool will not reopen in 2012. After a nearly two-year fundraising effort that saw supporters raise $642,000 for a rebuild of the aging Normal Park Neighborhood pool, plans stalled because state grant money is being delayed in the legislative process. Barring any other unforeseen changes, the pool will reopen in 2013. On behalf of the Friends of the Rutherford Pool, the City of Ypsilanti was awarded a $300,000 grant through Michigan Department of Natural Resources Trust Fund. But the state Senate and House of Representatives must approve the appropriation of that money, and several lawmakers delayed the process. Additionally, there are several administrative hurdles that must be cleared before the grant money is distributed, and Friends director John Weiss said the group isn’t expecting to receive the funds until July. Previously, the plan was to begin the bidding process in March and have the rebuild complete by June 15. Groups receiving the funds aren’t allowed to move forward with projects beyond initial design work, so a 2012 season at the pool is out of the question. Weiss said he was highly disappointed when he first learned the news because 200 families and organizations have donated money to the cause, and he feels responsible to them. “We never promised to do anything at any point, but we feel a responsibility to the community, and there is personal disappointment for our families,” he said. But the delay does provide some other opportunities, Weiss added. The Friends group is trying to raise another $50,000 so they can build an eight-lane pool instead of six-lane pool. The delay also will provide more time to find help or in kind opportunities with developing plans for and refurbishing the bathhouse. The Rutherford Pool sees around 17,000 visits annually, and 150 families hold passes. Daily visits during the summer range between 200 and 500, and the Friends group wants to build a larger facility to accommodate the community. The 40-year-old pool is long past its life expectancy and faces extensive structural and mechanical issues. Weiss praised the community for helping out with the fundraising effort and highlighted Eastern Michigan University’s contributions. The school has provided countless hours of in-kind work and is now helping with the bidding process, among other contributions. He said he is hopeful EMU’s construction school will provide help with refurbishing the bathhouse. “I’m actually excited about that because it doesn’t require a lot of cash to make significant changes and improvements,” Weiss said. The Friends group is discussing offering swim lessons or memberships through another swim facility, but those details have yet to be worked out. The Friends signed a memorandum of understanding signed with the city and developed a business and operating plan that the City Council approved in January. The city owns the pool, but it is the 501c3 Friends board that is responsible for its management. As a less formal entity, the Friends group has managed the pool since the city closed its parks and recreation department in 2003. When it began its effort to save the pool in 2010, the group was estimating a $1 million rebuild, but they were able to trim $320,000 out of the equation. City officials have praised the Friends group for its work. Thu, Mar 15, 2012 : 5:19 p.m.
Public pools are nasty. Its like taking a bath with 100 strangers. Thu, Mar 15, 2012 : 8:38 p.m.
Thu, Mar 15, 2012 : 5:07 p.m.
Tell us who the legislators are that are holding up the money, and many in this community will apply very strong pressure to them. Maybe it is time to cut the cord on this place - there are bigger issues and bigger fish to fry. It was a nice effort but it seems to be a losing one. And while I don't know this to be fact, a new pool at a new location might be cheaper than rebuilding an old. dilapidated one. Start fresh - don't live in the past or get caught up in sentamentality - Move on. Thu, Mar 15, 2012 : 6:05 p.m. I also fail to see why this is a losing effort. I think it's wonderful what a strong community has been able to achieve! Thu, Mar 15, 2012 : 5:57 p.m.
How is this a losing effort? The pool will be built--just a little later. And, as the article says, it may be better for the delay. Thank you, Friends of Rutherford Pool, for all your work!